This book introduces state-of-the-art approaches, methods and research, focusing on smart management of rainwater. In addition, it provides an overview of projects from across the world, illustrating how rainwater-smart management has been implemented in drylands. Focusing on the scientific perspective it demonstrates how rural dryland agriculture can be improved. 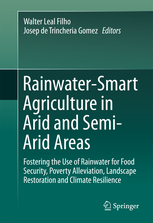 It also documents the wealth of rainwater-smart know-how available today, and replicates and transfers results to other countries and regions, to encourage cross-sector interactions among various stakeholders, such as practitioners from governmental and public organisations, policy- and decision-makers, and teaching staff from academic scientific institutions. The contributors showcase vital lessons learned from research, field projects and best-practice examples. They address the integrated use of rainwater harvesting management with landscape restoration practices and water-, and climate-smart agriculture for food security and poverty alleviation in arid and semi-arid areas. Original research, combined with the contributors’ synthetic approach, lays a foundation for new concepts and ideas. Through case studies and research reports, the book discusses all the relevant issues necessary for the comprehensive analysis and successful implementation of the technologies in rainwater management. Highlighting the working principles and technical recommendations with regard to cost-efficient rainwater-smart solutions, it is of interest to practitioners. It is also a valuable resource for academic specialists, professionals and students, since many development agencies are funding rainwater harvesting for irrigation purposes.